With computer modeling and increased demand for green building, high performance custom homes are going modular (a.k.a. "prefab" in Dwell Magazine circles) like never before. Why? Because they are built in a computer controlled environment and transported to the site nearly complete. They are more energy efficient and much stronger. Hurricanes Katrina and Rita proved in numerous studies: modular homes prevailed where stick built homes were washed away. * Finish Werks builds in Anne Arundel, Baltimore, Charles, Carroll, Harford, Howard, Montgomery, Prince Georges, and Queen Anne counties, but is licensed in all counties and may deliver ModularDirect and/or Turnkey to greater Maryland depending on project conditions. Please inquire. 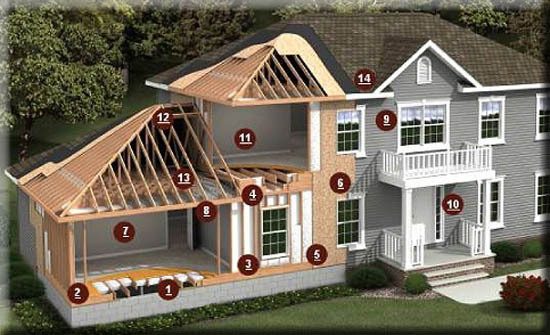 "...modular homes are in many ways superior to stick-built homes, and, once assembled, cannot be distinguished from their traditionally built counterpart"
Take a look "under the hood"
OVE (optimum value engineered) 2x8 exterior walls 24" O.C. 2x4 interior wall studs 16" O.C. Sheri Koones, author of the modular housing book, Prefabulous, shared 10 reasons builders can share with prospective buyers why to buy a modular house.